Atlantic Terrace Condominiums in Daytona Beach Shores, Florida recently began a renovation project to update all 22 units, modernize the lobby area, and update the landscaping. Interiors have not been renovated or refurbished since 2004. The exterior of the building received updates in 2012. Renovations will be completed by the beginning of 2016. Each of Atlantic Terrace Condominium’s 1,500 square foot units feature a living area, two bedrooms, two bathrooms and a kitchen. The complete unit renovation includes new flooring, new texture on walls, new fixtures, new appliances and new furnishings. Bedrooms will receive new carpet and new furnishings such as bedding, draperies, pictures, lamps and furniture. Bathrooms are getting new tile, fixtures, and countertops. In addition, new washers and dryers are being installed in most units. Owners will see the extensive refurbishments the moment they walk through the front door. The lobby is getting a modern makeover, with a functional and attractive front desk area for check-in and a comfortable owners’ lounge with new furnishings. The owners are also getting a brand-new fitness center on the second floor. Hospitality Resources & Design in Orlando, Florida created the new unit designs. Commstruct, LLC in Charlotte, NC completed the renovations. 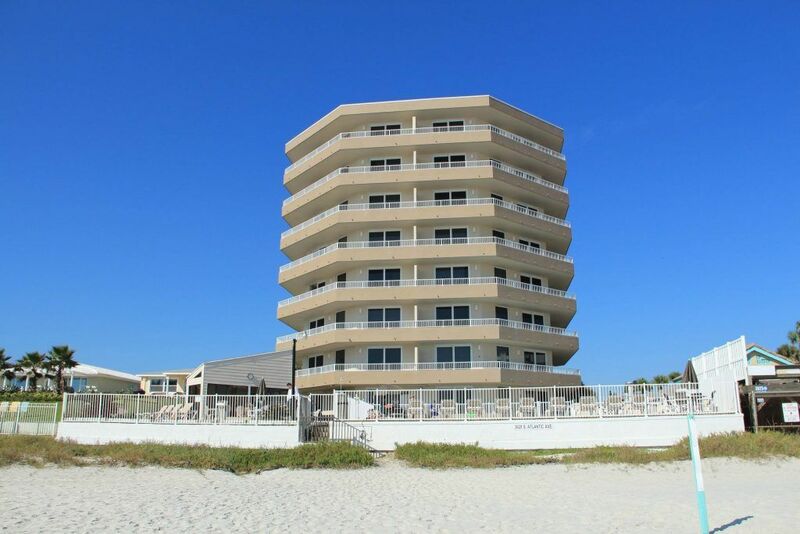 Located in Daytona Beach Shores, Atlantic Terrace Condominiums features oceanfront accommodations in a spacious 1,500 square foot suite.